…and his laugh is Super Long. Every word is taken tongue-in-cheek, every picture matches. And yet the tone is loveable, warm and enchanting. The punchline is simplistic yet apt – the father denies he is a superhero, insisting instead that he knows of a superhero – his superhero son. There is also playfulness with the layout of the text – using bold and larger letters to convey emphasis and differentiation. Buy it here from Waterstones or on the Amazon sidebar. This was published last year by a new publisher, Sweet Apple, which continues to grow their list. Although slightly niche, in that it appeals obviously to those whose fathers have beards, it is both cute and original. For younger children than those I usually cater for, each page draws on an example of why the child loves his Daddy’s beard – and how it defines him. It draws on our sensory perceptions from describing the look of the beard – how it is different from other family members’ beards – to the feel of it in different situations, and finally to what the child imagines lives in it (spoiler: a teeny tiny cat). It also manages to draw in the rest of the family as the child witnesses their perceptions of what the beard means to them. This is clever in that it highlights the important place the father has within this family – as a protector, and a person whom they trust and look up to. 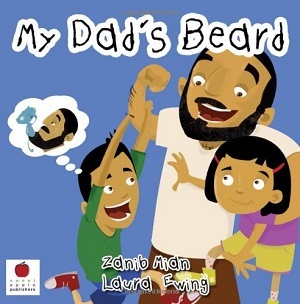 It draws on Islam in that it explains why this particular Dad has a beard, and so works as a picture book that reaches out to a diverse audience. Buy it here from Waterstones or on the Amazon sidebar. Many children’s authors absent one or both parents so that the children of the story can go on an adventure without parental restrictions. What’s beautiful about David Almond’s writing is that so often (as with Roald Dahl), it is the adults themselves who bear the idiosyncrasies that make the story so appealing. Although one parent is absent here – the death of the mother is an overriding concern throughout this short tale – the consequences lead to a strengthening and developing of relationship between the daughter and the father. 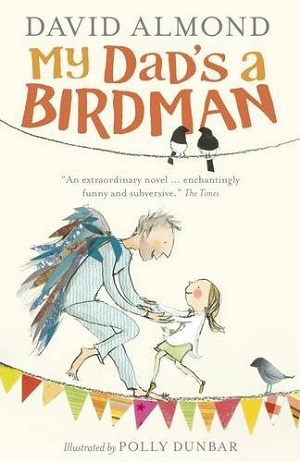 Lizzie’s Dad wants to enter a Human Bird competition, and believes he needs to adopt the characteristics of a bird to be able to fly. He encourages Lizzie to join him in this mad venture, despite the protestations of her adorable Aunt Dotty. The premise is barmy, the characters eccentric – but illuminated by Polly Dunbar’s flamboyant illustrations, the book manages to soar. Highly original, imaginative and everything a children’s story should be. Wonderfully typical David Almond. Age 6+. Buy it here from Waterstones or on the Amazon sidebar. Phil Earle’s fictional father comes about as close to Danny the Champion’s Dad as I can find. However, as with much children’s fiction I’ve been reading recently, this is a depiction of a modern Dad who fits right into our current world. Jake and his Dad love to spend every Saturday together pursuing their hobby in common – wrestling. 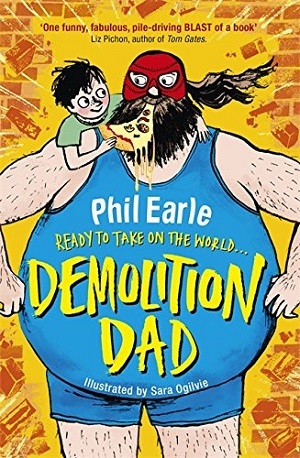 Jake’s Dad George knocks down buildings as a day job, and at the weekend takes part in wrestling matches – knocking down other men – and he’s really good at it. So good, that Jake thinks he should go public, and so secretly enters a video of him in action in a pro-wrestling competition. When George wins, he agrees to travel to America for training and a headline fight, mainly for Jake, but unfortunately things start to unravel, and it’s not quite the dream venture they had all planned. There were so many things to love about this book. As a refreshing change from much of the ‘humorous’ fiction in the marketplace for this age group – this book wasn’t full of silly jokes and slapstick happenings. It is extremely funny but the humour is carefully woven into the story; there are many wry laughs here, not fart jokes. Also, the wrestling is a major factor but doesn’t dominate. What comes across and leaves quite an impression is Phil’s adeptness at portraying the hidden emotions of parents, the sense of a community in a town, friendships, and most importantly father and son relationships. It’s clever, has emotional depth, and packs quite a punch. Touches I enjoyed – how the mum’s past career influences her behaviour, Phil’s capturing of the small town landscape complete with the ‘house that was stolen’ mid terrace, and Jake’s wonderful innocence and naivety – and his gradual responsive awareness. There are some stunning illustrations from Sara Ogilvie – the cover itself betrays this – but there are even better ones inside (the fight scenes are spectacularly hysterical). Moreover Phil Earle’s self–referential authorial musings are brilliant – see chapter 17. 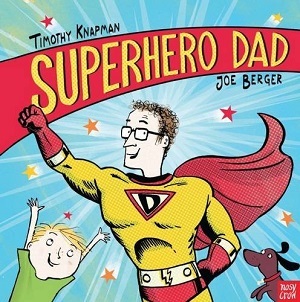 If you buy your Dad just one book this Father’s Day – make it this one. (then keep it for yourself). Age 8+. Buy it here from Waterstones or on the Amazon sidebar. 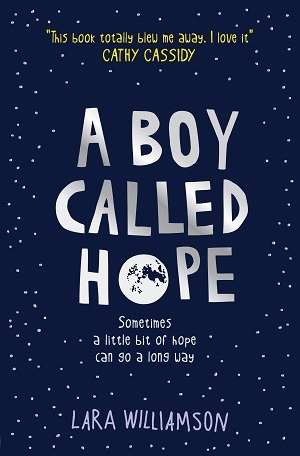 On the other end of the spectrum from Danny Champion of the World’s Dad is the Dad in A Boy Called Hope. That’s mainly because he’s absent, having left his family and remarried. This is heartbreaking for Jake Hope, the boy in the story, especially when his Dad appears on the television in his role as a journalist – the first time that Jake has seen him in four years. Sadly, this speaks to so many children today. But despite the sadness of the situation, this is a poignant and uplifting story. Jake comes to see that he is surrounded by a loving family – especially as his Mum has met someone new, Big Dave, who actually turns out to be a terrific father to Jake. Lara Williamson has magic on her side – she imbues the novel with a myriad of symbols and devices from sky lanterns to glow-in-the dark statues and stars that lift Jake’s situation from the humdrum of normality to the wonder of childhood – she lets us see things through Jake’s eyes that we would never normally capture in our vision. There is humour too – Jake frequently misinterprets situations which leads to some trouble, but in the end, much laughter, and there are some splendid characters too – from his friends Christopher, who has his own troubles, to Jo, who is obsessed with the saints. It was also hugely enjoyable to read about Jake’s teenage sister through his eyes – older siblings can seem so detached from the family until you dig beneath the surface a little. This is a wonderful book – fantastically true characterisation, and great writing. Be prepared for tears to accompany the laughter though – as in real life – sometimes you have to make the best of what you’ve got. You can buy it here from Waterstones or see the Amazon sidebar.